It is expected to involve a 50% write-down of Greece's massive government debt, the BBC's business editor Robert Peston says. Turning the present outline into a practical reality will be immensely difficult, our editor says. But he adds that the price of failure could be a financial crisis that would probably turn anaemic growth into a recession or worse. Investors have so far been unimpressed with the speed at which policymakers have dealt with the eurozone debt crisis, and analysts say that action, not words, are needed to calm volatile stock markets. Over the weekend, the G20 reasserted its commitment to "a strong and co-ordinated international response" to the crisis, but analysts warned this would not be enough to satisfy investors. "Given that there were no details on how [the G20 would combat the crisis], it will not do much to alleviate market stress without some concrete action," said Mitul Kotecha at Credit Agricole. European markets fell at the start of trade on Monday but then rallied. By lunchtime, Germany's Dax index and France's Cac 40 were both up more than 3%. Earlier, Asian markets had fallen, with Japan's Nikkei index closing down 2.2%, Hong Kong's Hang Seng falling 1.5% and South Korea's Kospi dropping 2.6%. The problem, they said privately, was that ministers couldn't talk openly about a new solution to the crisis when the old one had not even been passed by national parliaments. This was a particular issue, naturally, for Germany. 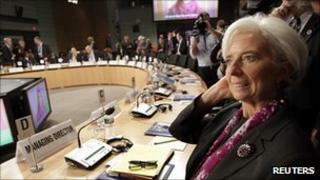 The reports about the emerging rescue plan come after the annual meeting of the IMF in the US capital last week. The package is expected to involve a quadrupling - from the current projected level of 440bn euros - in the firepower of Europe's main bailout fund, the European Financial Stability Facility (EFSF). This would be done by putting in place an arrangement that would allow the European Central Bank (ECB) to lend alongside the fund, our editor says. The EFSF would take on the main risk of lending to governments struggling to borrow from normal commercial sources - governments like Italy. It is also thought that private investors in Greek debt are likely to have to accept a 50% reduction in what they are owed, our editor says. Eurozone leaders agreed a plan in July, which has yet to be ratified, that provided for a reduction in Greece's repayments to banks of about 20%. After talks with IMF chief Christine Lagarde, Greek Finance Minister Evangelos Venizelos said that Athens would do "whatever it takes" to reduce its huge level of debt, which is currently about 160% of the country's gross domestic product. Publicly, world leaders have said there is "no plan" for a Greek default, but reports suggest officials are working on a plan to allow Greece to default on some of its debts and remain in the euro. The third element of the rescue plan envisages a strengthening of big eurozone banks, which are perceived to have too little capital to absorb losses. But our editor says that MPs in eurozone member-states will be concerned that taxpayers would be taking much more risk, and banks will bolt at raising expensive new capital. In Washington, Mr Venizelos also pledged that Greece would stay within the euro, but denied that the Greek crisis was enough on its own to cause a "domino effect" elsewhere in the eurozone. Earlier, Greece's minister for international economic relations, Constantine Papadopoulos, said leaving the euro would be "catastrophic" for Greece. "I personally think [leaving the eurozone] would take us back to the 1960s or 1970s," he told the BBC's Andrew Marr programme. Proposals put forward in July would allow the EFSF to buy the bonds of highly-indebted countries, and to make credit available to both them and under-capitalised banks. These proposals have yet to be fully ratified. He later clarified that he was not referring to the political situation at the time, when the military took power in a coup, but the standards of living and the structure of the economy. This week will see EU and IMF officials return to Athens to examine the country's progress on its deficit reduction plans. Greece is still receiving money from an initial rescue, agreed in May last year, although it will not receive the next tranche if inspectors rule that it is not keeping up with its spending cut targets. Analysts say this is a real possibility. Without this month's loan, Greece will not be able to meet its debt payments by the middle of next month. A second EU-IMF bailout was agreed for Greece in July of this year but that still has to be ratified by the parliaments of a number of eurozone member states.